Happy Monday loves and happy week of Christmas! Linking up with Biana from B Loved Boston and Fizz & Frosting today! So beyond excited that Christmas is just a few days away. I have totally completed my holiday shopping and I'm ready to go! I'll be working a full day today and a half day from home tomorrow but will be off for the rest of the week. I will also be doing a blog post on Wednesday but after that I'll be taking a break from the blog until next Monday! I definitely need this break to relax, refresh, and to spend time with family. If y'all have any holiday parties or have any Christmas plans that require you to get a little more dressed up, I think this outfit would be great! It's cozy enough with the cape and the sequins make it super festive. I also think this would be an awesome New Year's Eve outfit. This skirt sold out last week at J. Crew BUT I linked to one almost identical at Banana Republic and it's 40% off! I would love to hear about your holiday plans in the comments! You can never go wrong with some shine! I love that skirt, so festive and fun. Have a great week! Your skirt and shirt are so beautiful together! I love the silver sequins and how it perfectly compliments the deep green of your top! Perfect holiday look! Have a wonderful week! That skirt is perfect for the holidays! Sequins as the best!! U look so pretty! Love that skirt and the red lips are totally on point! Sequined SENSATION!!! Just love this shirt, you look so very pretty and festive!! You look so gorgeous and festive! So in love with that sequin skirt! AHH this outfit is just so freaking cute! Love the green, love the sparkle, and love those booties (just picked up a similar pair!). Perfect holiday outfit. You look incredible! 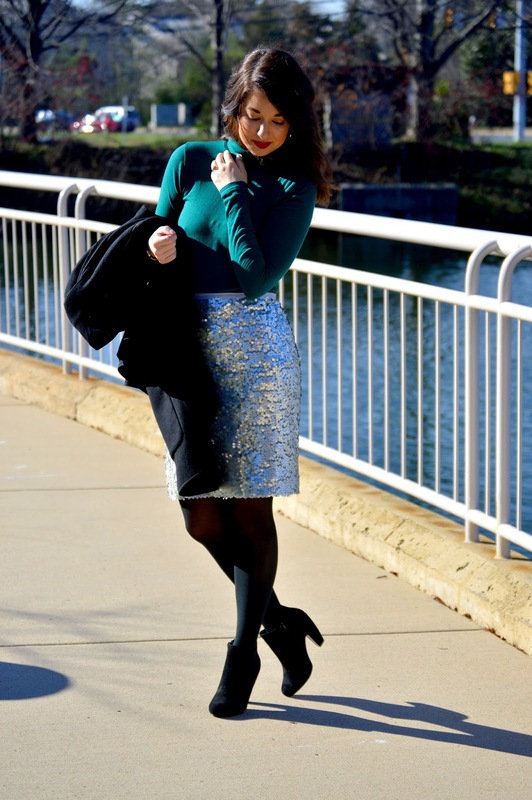 This skirt is a stunner, and I love it paired with the first green turtleneck. Beautiful! Soooo cute!! Loving the sequins! This is the perfect NYE outfit, Kelly. Happy Holidays to you and your family! What a fun and fabulous outfit! Happy Holidays beautiful. What a gorgeous skirt! I love this whole look. that skirt is so cute! What a great holiday and NYE outfit! I am IN LOVE with this outfit because of that sequin skirt. I wanted something sequin for this season, but got shiny instead. Off to a Christmas staff lunch tomorrow so I'll be wearing it then. I love the sequin skirt!! Gotta love a bit of sparkle in December... you look stunning! That sequin skirt is super pretty! Beautiful festive outfit lady! That skirt is perfect! Wishing you a lovely week! Festive, doll! Loving the silver sequins! You let me confused with that skirt.